Over 8 months on the NYT Bestseller's list! "Not only was I totally hooked...by the end I was totally blown away." "Yoon gives readers complex characters and rich dialogue that ranges from humorous to philosophical. This heartwarming story transcends the ordinary by exploring the hopes, dreams, and inherent risks of love in all of its forms." "VERDICT Everything, Everything is wonderful, wonderful." "This extraordinary first novel about love so strong it might kill us is too good to feel like a debut. Tender, creative, beautifully written, and with a great twist, Everything, Everything is one of the best books I've read this year." "I give all the stars in the sky to Nicola Yoon's sparkling debut...powerful, lovely, heart-wrenching, and so absorbing I devoured it in one sitting. 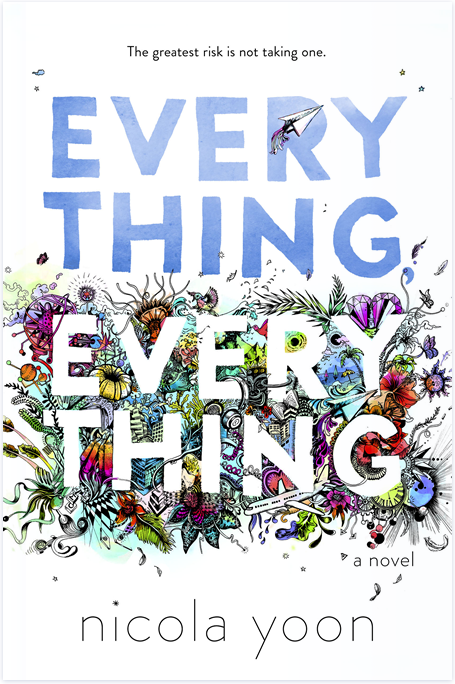 The rare novel that lifts and shatters and fills you all at once"
"With her stunning debut, Everything, Everything, Nicola Yoon has constructed an entirely unique and beautiful reading experience. Gorgeous writing meshes with original artwork to tell a love story like no other. You've never read a book like this"
"Everything, Everything has everything...romance, heart and intelligence. Nicola Yoon's book and voice stayed with me long after I finished reading." "There's a quiet beauty about Everything, Everything that kept me captivated from start to finish. Olly and Madeline's love story stole my heart." "I’m a big fan of voice-dominated fiction, and protagonist Maddie --- a girl who is “allergic to the world” and can’t leave the house --- is a whip-smart, thoughtful and genuine narrator. "But Yoon’s story, about Maddie, a girl who’s literally allergic to the world, is something new: a vibrant, thrilling, and, ultimately, wholly original tale that’s bound to be an instant hit..."
"...an easy romance to get caught up in." Taiwan - Sun Color Culture Co.